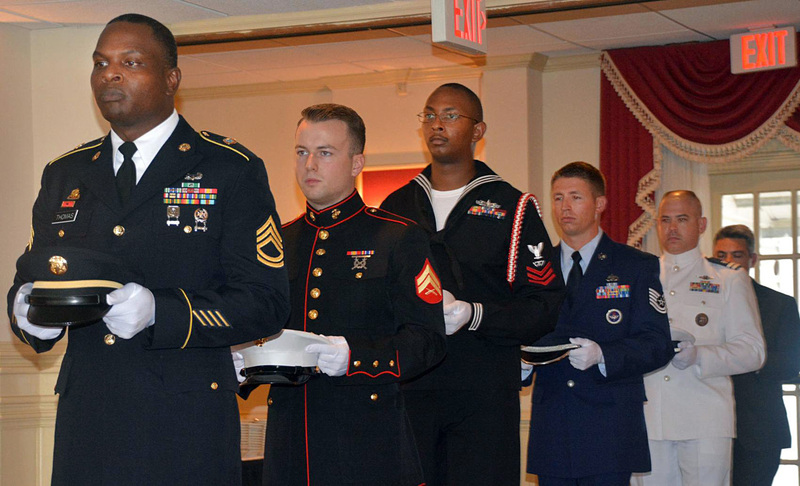 Community members and guests from the local area gathered for the annual Commemoration of the 50th Anniversary of the Vietnam War and POW/MIA National Recognition Day Luncheon at the Lee Club. The Robert E. Lee Chapter of the Association of the U.S. Army sponsored the observance in conjunction with the U.S. Army Garrison, Fort Lee. Sgt. Maj. Darrick A. Brown, Joint Mortuary Affairs Center sergeant major, was the guest speaker. He shared his thoughts about the long-practiced military occupation that he now oversees, and how those experience have affected his life. The annual POW-MIA observance, he noted, is emblematic of America’s duty to not forget and bring those still missing home. “I am constantly reminded of 82,232 service members listed as missing in action from past conflicts,” he said. The Garrison Commander, Col. Hollie Martin, said that next year marks the 50th anniversary of the first news story about prisoners of war and those missing in action in Vietnam. “The story inspired families of missing service members to seek the answers and raise awareness of our responsibility to look for those who were not able to make it home on their own,” she said. Adding, “Their persistence helped bring home prisoners of war from many previous battlefields. From February to April in 1973, Operation Homecoming repatriated 591 United States prisoners of war.” The event also included a Missing Man Table and Honors Ceremony performed by the installation’s joint service honor guard. The 392nd Army Band provided music. National POW/MIA Recognition Day was established by an act of Congress in 1998. The 2008 National Defense Authorization Act allowed a commemoration program for the 50th anniversary of the Vietnam War. Its objectives are to honor veterans and their families for their sacrifices, highlight the contributions of the armed forces, and recognize those who made contributions on the domestic front, among others. Memorial Day 2012 was the official start of the commemoration. It is scheduled to conclude on Veterans Day 2025.